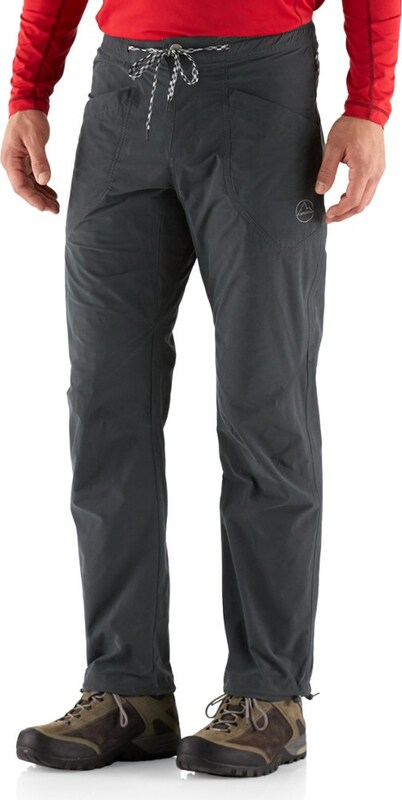 Very comfortable hiking pants, highly recommended! I purchased a pair of the prAna Stretch Zion Convertible pants in the spring of 2016 (see my review of those pants here). After a year of loving those pants, I wanted to get another great pair of comfortable hiking pants. This time, I decided to give the regular (non-convertible) Stretch Zion Pant a try, and purchased these in the spring of 2017. Being the bargain-hunter that I am, I searched the internet until I was able to buy a prior year closeout deal for only $40 for a pair of dark olive green pants. Because I had put on a few pounds at the time I purchased them, I bought the 33-waist, 32-length (the prior convertible pants are size 32x34). In the year I've owned these pants, I've lost about 10 pounds (down to about 175), so so I would now prefer to own a size 32-waist. However, the integrated cinch/belt still allows me to wear these pants very comfortably, even without a belt (though I generally prefer to wear a belt). I would have preferred about 1/2" longer length, but that's my personal preference. 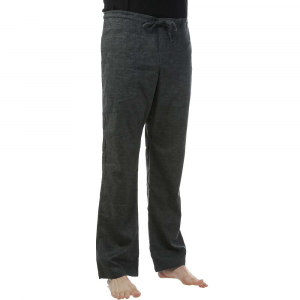 In comparing to the Convertible pants, these non-convertible pants have a slimmer cut. I prefer the looser cut of the convertible pants, especially when seated, but these pants are still very comfortable. 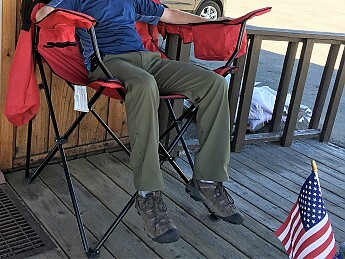 Sitting in the oversized camp chair in Stanley, ID, wearing the prAna Stretch Zion. July 2017. Obviously the main difference between these pants and the convertible pants is the lack of zip off lower legs. 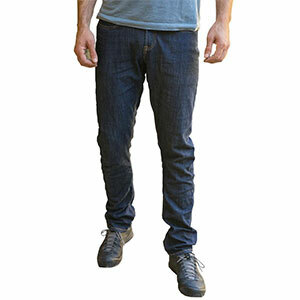 However, these pants do offer snaps that allow you to roll up the bottom of the pant legs and snap them securely. I have found this most useful on a couple of shallow stream crossings, as well as rolling up my right leg when I decide to go for a quick bike ride around the neighborhood with my kids and don't want my pant leg to get chewed up by the chain/chainring. 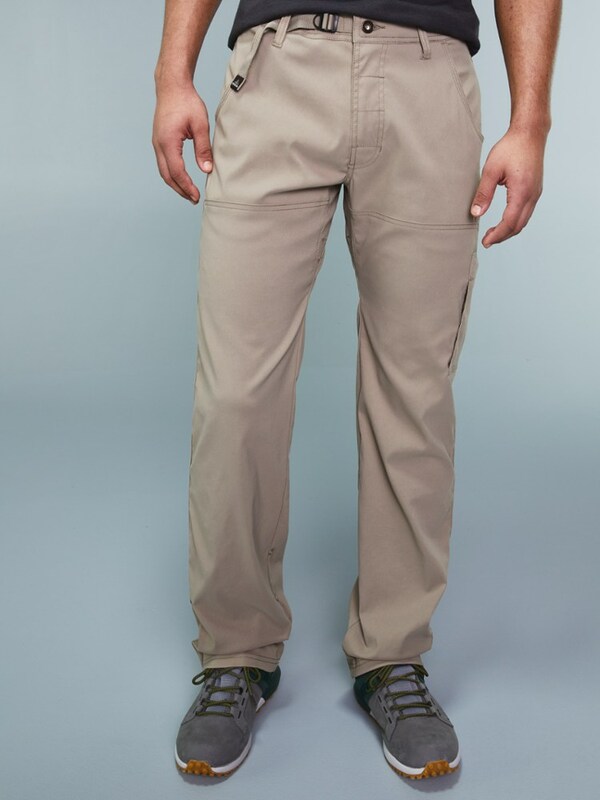 Another difference between these two pants is that these pants only have one cargo pocket, located on the left leg. While this may help these pants look a bit more "refined" or less "outdoorsy," I've found myself in multiple instances wishing I had a second cargo pocket on the right leg. I've never once been glad it only had one pocket. The pocket it does have offers the same dual-zipper entry, which is handy. A normal zipper on the top of the pocket, and another entry zipper on the side can be easily accessed while seated. Entering the Sawtooth Wilderness Area on the way to Imogene Lake, July 2017. 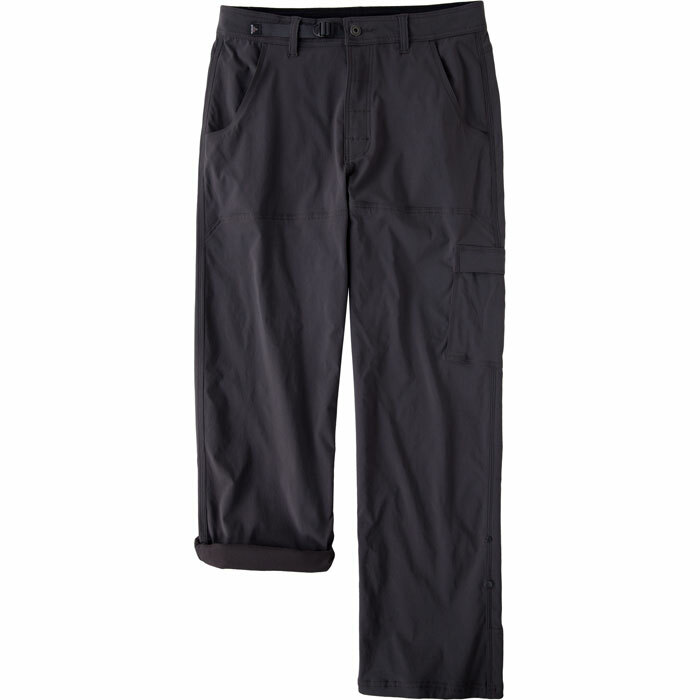 I find myself switching between these and the convertible Stretch Zion pants, but I pretty much always reach for one of these two pants when heading into the outdoors. I'm likely going to stick to one of these two pair of pants for all my future hiking pant needs. Great review, mackaym! Thanks for taking the time to share it and some pictures. Great pant to walk around downtown Portland, tackle the slots of Escalante, and climb a few pitches on El Cap. I've literally done everything in these pants. Great overall weight for durability but amazing breathable. Small crotch holes for added ventilation and water drainage. The stretch in these pants is incredible. I've never had a move that these pants restricted me from doing. My only downfall with these pants is that prAna built in a "belt" and the metal buckle broke on me. I'm too lazy to send them back and have remedied the problem with a zip tie (duct tape was a close second). Zippered pockets keep belongings secure and dry time on these is incredibly fast! Truly recommended! 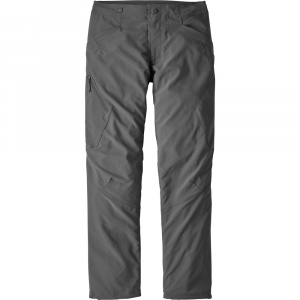 These pants fit great and are perfect pants for any outdoor adventure. Perfect for hiking! The material is very comfortable, stretchy and breathes very well. They have an adjustable waist so you can fine tune them to your waist size. The material is very strong and durable. The pants also whisk water away pretty well. The water that does soak in a bit dries very fast. They layer well in cold weather with my Patagonia Capilene long underwear. The material does burn very easy so be careful around the campfire!! I highly recommend these pants. I have 3 pairs of them and they are the only pants I wear for hiking and adventure. I am wearing the PrAna pants in the picture below. Finally a stretch pant with good fit and style. So good I don't wear any of my other pants or shorts. No more torn crotches or 18-inch high boulder restrictions. Fit is awesome. Most stretch pants are too tight; these are loose and the style is so clean I wear them around town every weekend. I did fight some blackberries last weekend and they pulled some threads loose, but hey, no pants are invincible. It took a while to get a pair of these that fit right. It took a while to get a pair of these that fit right. I'm 72" and 155lbs. Most pants I have are 34" waist, so initially I went with the Large/32" inseam. They were a little too wide in the waist and too long (I have shorter inseam than most 72" guys). I ended up finding them at a local outfitter in Minneapolis and the Medium/30" inseam fit perfect. 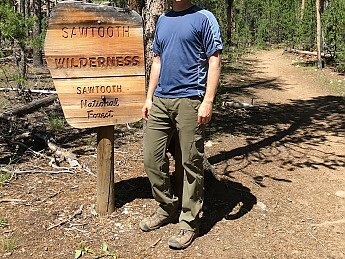 While I was there I tried on the Mountain Hardware Mesa convertible and a pair of Exofficio's. These felt the most comfortable and fit me the best. The price is hard to swallow, but after wearing these on 2 different 5 mile hikes, I'm very happy with the investment. Excellent stitching and durable fabric. It will be hard not to wear these everyday! I really like how these pants fit and wear on the trail. The are not to heavy nor are they to light. The pant legs are also not to bulky or baggy. My only complaint is the belt system doesn't stay tight. I have used a safety pin that locks the belt in place and that works well. These are very comfortable pants! They are too long for me but would be perfect for a taller person. I just use the buttons to roll them up so they don't drag. Great bouldering pants w/good freedom of movement. I highly recommend them for lounging to being active doing whatever.